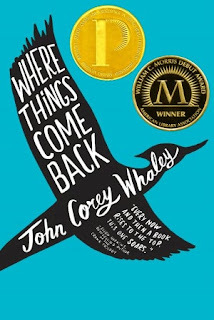 Where Things Come Back by John Corey Whaley has the distinction of winning the William C. Morris Debut YA Novel Award and the Michael L. Printz (the Newbery for YA books) in 2012. And deservedly so. 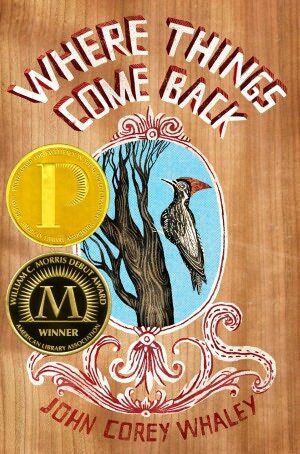 Where Things Come Back is masterfully constructed, with two story lines that seem to have nothing to do with each other but knock the breath out of you when you do finally realize how they intersect. Seventeen-year-old Cullen Witter begins Where Things Come Back with a first person narrative voice that immediately draws you in. His story alone could sustain an entire novel, it's so abundant with detailed characters and plot threads. I find that in my reviews of YA books, I often end up talking about narrative voice and character development and Whaley's has both in impressive amounts. Cullen is wry and jaded, an aspiring writer who spends more time recording potential titles for his novels into a notebook than he does writing the novels. "I was seventeen when I saw my first dead body. It wasn't my cousin Oslo's," is Cullen's notable opening line, which comes after a chapter with the title, "All the Idealism in the World Couldn't Shake This Feeling." Cullen's narrative calls to mind the masterfully genuine voice of Tom Henderson, the main character of the must-read novel King Dork by Frank Portman, which in turn echoes Holden Caufield. All three are knowing, articulate, weary teenage boys who ultimately reveal their vulnerabilities and lack of experience as they cope with the cards life has dealt them. Cullen seems like your typical social outsider, preferring the company of girls over guys, except for his best friend, who happens to be awkward in his own specific ways. He is in love with a "beautiful girl who had a big, burly boyfriend." But, two weeks into summer break, Cullen's life changes in ways that force him to step outside of his outsider persona. John Barling arrives from Oregon to find the elusive Lazarus woodpecker (modeled on the Lord God Bird, otherwise known as the Ivory Billed Woodpecker, a bird believed to be extinct, with unsubstantiated reports of sightings occurring from time to time) in the forests of Lily and a small-time media frenzy ensues, shaking things up in the small town. And Gabriel disappears, without a trace. Cullen is faced with the dichotomy of life around him going on like it always does, despite the fact that Gabriel is missing, and intense grief and need stop the world and make sense of the inexplicability of Gabriel's disappearance. Alternating chapters written in third person tell a story that begins with Benton Sage, a teenage missionary who is sent to Ethiopia. Benton's mission is a failure and he asks to return home. But, on his way back to the States, a pivotal moment occurs when he learns about the Book of Enoch, an apocryphal part of the bible that is canonical only for the Ethiopian Orthodox Tewahedo and the Eritrean Orthodox Tewahedo Church but no other Christian group. Once back in the States, Benton begins quietly begins his freshman year at the University of Atlanta, friendly, but mostly a cipher to his roommate. Benton's secret notebook is discovered by his roommate, his curiosity over the Book of Enoch turning into an obsession that rivals, if not exceeds that of Franny Glass and The Way of the Pilgrim. Whaley tells the story of Benton and his roommate in a straightforward, almost portentous way that makes the growing parallels between the two seemingly unconnected stories build to an ominous pitch. He counters this with Cullen's narrative, which remains pitch-perfect throughout the story as he experiences grief, confusion, anger and frustration over Gabriel's disappearance and the strange turns his life in Lily seem to be taking. 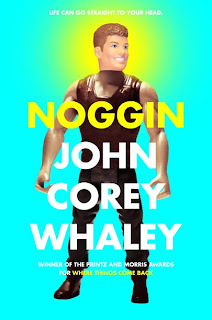 One aspect of Cullen's narrative that I especially loved, both for the tone and personality that it exhibited, but also for the way that Whaley uses it to present him as a possibly unreliable narrator, is his writerly observations that always begin with the words, "When one." As in, "When one suddenly feels a young woman's hand crawling up under his shirt," and "When one is an hour and fifteen minutes into a three-hour boat tour and realizes he knows just as much about the area as his guide." These moments are balanced out by Cullen sharing some of the insight he has been given by Dr. Webb, the psychiatrist he begins seeing after Gabriel disappear off the face of the earth. This book is called Where Things Come Back for a reason. The Lazarus bird is not the only thing that comes back to Lily. Long after you finish reading the book, you'll be ruminating over the plot in wonderment over the layers of meaning and plot that Whaley entwines into one seamless story. Amazingly, Whaley brings the narrative of both story lines back to a point the near beginning of the book, the day that Cullen discovers Gabriel is missing, for a heartbreaking ending that is sure to spark serious discussions among readers. All I can say is that it is stunning. Absolutely stunning. 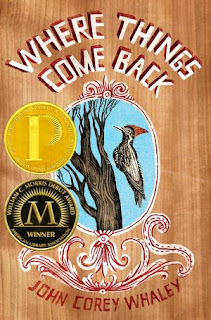 Where Things Come Back should be a book group pick, for teens and/or adults, because it is the kind of book that, once you have read it, you press on people and beg them to read so that you will have someone to discuss it with. Read it with a book group, start one if you have to, so that you can avoid the feeling of desperation when you read the last lines of Where Things Come Back and have no one to turn to. And, while it sounds markedly different, I can't wait to read Whaley's next book, Noggin, due out April, 2014.